This project addresses HEMP development activities to three application fields of electric propulsion systems – LEO, Telecommunication/Navigation and Space Transportation/Exploration/Interplanetary applications. The HEMP-Thruster concept is an ion propulsion technology that is based on the use of permanent magnets for plasma confinement. Through this confinement there is no discharge channel erosion and the technology provides excellent lifetime of the thrusters which is a unique feature of the HEMP technology. In addition the used cathode technology is backed by several hundred millions of operational hours of in space operation. Among other advantages, the technology enables very wide operational ranges and the lowest system complexity of all competing EP technologies creating unique application possibilities. The HEMPT-NG proposal addresses the topic COMPET-3-2016-a on Incremental Technologies which is part of the SRC - In-Space electrical propulsion and station keeping. It will contribute to the principal target of the EPIC roadmap “to increase the competitiveness of the EP systems developed in Europe” by developing an integrated solution based on HEMPT for the thruster, the fluidic management system and the power processing unit. The final project results will consist of two EPS: the first one ideally suited for LEO applications with a power between 200 to 700 W and the second one optimized for Telecom/Navigation applications with a power from 3 to 5 kW. Both thrusters will be capable of dual-optimized mode operations allowing orbit raising and station keeping with the same EPS. The EPIC Workshop 2017 was held on 24-25 October 2017 in Madrid – Spain at CDTI (Centro para el Desarrollo Tecnológico Industrial, Madrid) premises and was organized by EPIC. Operation of the same unit in different operating regimes (dual voltage) featuring in orbit selectable ISP maximizing the propellant savings and giving flexibility for new failure recovery strategies. In addition, based on existing production experience from Travelling Wave Tubes (TWTs), power supply units and Flow Control Units the consortium has the capability to quickly create the production capacity for higher volume production needed particularly for LEO applications, which may reach hundreds of systems per year. Today this capacity does not exist in any European company. In addition, the implementation of new technology bricks will improve European independence, since, for instance, the new flow control technology is a fully European solution. As Power Lead Center inside the Thales Alenia Space group, Thales Alenia Space BELGIUM is the European number one in power conditioning and distribution equipment for any type of satellites. OHB System AG as a wholly owned subsidiary of the OHB SE is the core company of the Space Systems business unit. Thales Alenia Space was created on April 10, 2007 when Alcatel-Lucent transferred its space business to Thales. POWER PROCESSING UNIT FOR TELECOM./NAV. Airbus Defence & Space GmbH, 100% owned by Airbus Group (the former EADS Company) is a worldwide leader in the space domain. Thales is a leading international electronics and systems group, addressing defense, aerospace and security markets worldwide. The University of Greifswald was founded in 1456 and is one of the oldest academic institutions in Europe. TAS-UK is a subsidiary company of Thales Alenia Space. A joint venture between Thales (67%) and Leonardo (33%), Thales Alenia Space is a key supplier of satellite and orbital infrastructure solutions. Aerospazio Tecnologie was founded in 2000 with the aim of providing testing and engineering services in the fields of vacuum technology and Electric Space Propulsion. Thales Alenia Space’s German subsidiary, located in Ditzingen, Germany, was founded in March 2011. However, its heritage goes back to the company SEL Alcatel (SEL: Standard Elektrik Lorenz) and the 1980-ies. 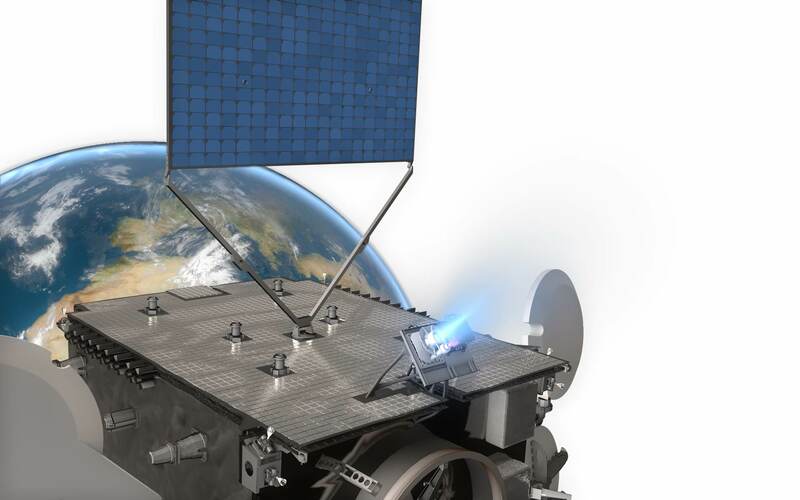 An EPS addressing the Telecommunication (GEO) and Navigation (MEO) application segment with a power range of 3-5 kW, allowing all-electric satellites to save up to 80 % of the propellant mass (compared to chemical propulsion systems). A LEO EPS addressing the LEO application segment with a power range 200 W – 700 W, enabling the business cases of the newly emerged LEO constellations e.g. targeting worldwide internet services access. Assessment of the use of the above-described “GEO” solution for the space transportation and interplanetary mission application using clustering techniques going up to or beyond 20 kW of processed spacecraft power, enabling for instance ambitious scientific missions like space travel to Mars or other planetary rendezvous missions. The project HEMPT-NG receives funding from the European Union’s Horizon 2020 research and innovation program under grant agreement No. 730020. This homepage reflects only the Consortium’s view. The EC/REA is not responsible for any use that may be made of the information it contains.